Thank you for your interest in Stimulators. Please complete and submit the form below and an ADInstruments representative will aim to get in touch within one working day. If you’d like to speak to someone immediately, office contact information is available from the contact page. 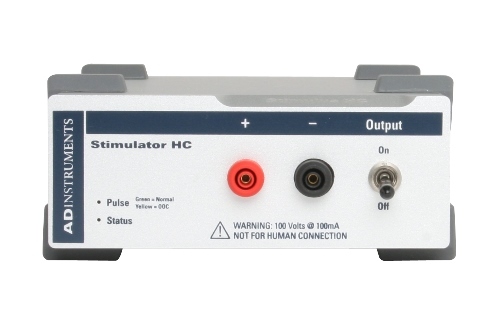 A LabChart controlled, constant high current stimulator, which is designed for direct or field stimulation of tissue samples in vitro. It is supplied with Stimulator HC Leads (2m). 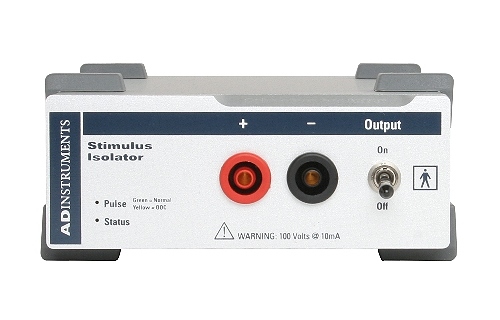 Current output of up to 10 mA (Stimulus Isolator), and to 100 mA (Stimulator HC) and at 100 V compliance voltage. A Status indicator light on the front panel; lights green with every pulse. A small internal beeper can be enabled to give an audible beep with every pulse delivered. Safety indicators: A single multi-color indicator displays the Stimulator HC status. A green flash indicates delivery of a valid stimulus. A yellow flash indicates an out-of-compliance condition (OOC). Note: Rise and fall times are proportional to load resistance and capacitance. Power source: Non-isolated circuitry supplied by PowerLab via I2C connection. Isolated and high-voltage circuitry derives power from the external 12 V AC, 300 mArms, wall-plug transformer. High voltage isolation is provided by an internal isolation transformer. No batteries required. Power source: Non-isolated circuitry supplied by PowerLab via I2C connection Isolated and high-voltage circuitry derives power from the external 12-volt AC, 300 mArms, wall-plug transformer. 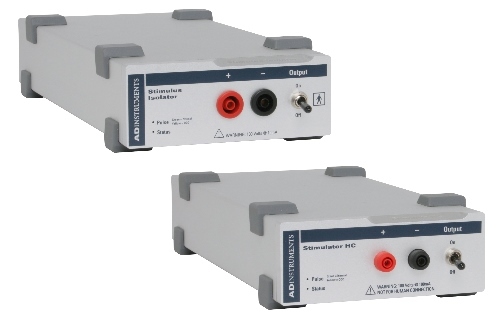 High voltage isolation is provided by an internal isolation transformer. No batteries required.